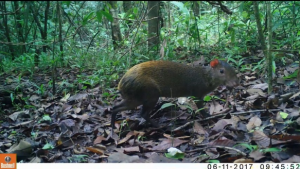 Collecting 60 camera traps is no easy task, especially when 52 of them are off-trail in the dense tropical rainforest and getting to them involved river crossings and scrambling up steep muddy ridges. These camera traps were part of a study where we combined forces with PhD student Juan Sebastian Vargas (University of Toronto). This work will continue and become part of the growing Camera Trap Network made up of conservation organizations, ecolodges, researchers and land owners that all share an interest and passion for conserving wild cats. 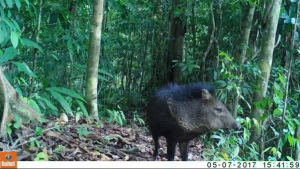 This collaboration will help achieve long-term monitoring and an understanding of wild cat presence, movement and behaviour here on the biodiverse Osa Peninsula, including Piedras Blancas and Corcovado National Park. But there is one illusive wild cat where sightings are incredibly rare or near impossible: the jaguarundi. We could not believe our eyes when we stumbled across footage from one of our cameras of the mysterious jaguarundi. The challenging work of setting up cameras off-trail had paid off! The jaguarundi was not so mysterious anymore as this awesome footage gave us a spectacular insight into its behavior as we watched it mark and scent its territory. Although the jaguarundi is thought to be an elusive wild cat, we were very pleased to find out it is not camera shy!